As many may have noticed, the price of $XLM soared over the last few days. In the picture above, you can spot the support points that were created by the Moving Fibs (custom) indicator script. Above is another look at the major resistance point that the price of $XLM is currently nudging against. However, this may not be the case for a few reasons. What this subtitle means (in a nutshell), is that most of the indicators on the daily chart for $XLM are still reading grossly overbought conditions. For the Ichimoku truthers that still believe that the Ichimoku settings are ‘inaccurate’ for cryptocurrency, just know that you are dead wrong. We would link the article here, but that is currently only available to subscribers as well as those that have bought our TA bundle. The price has nearly broken south of both the conversion & base lines (bearish). 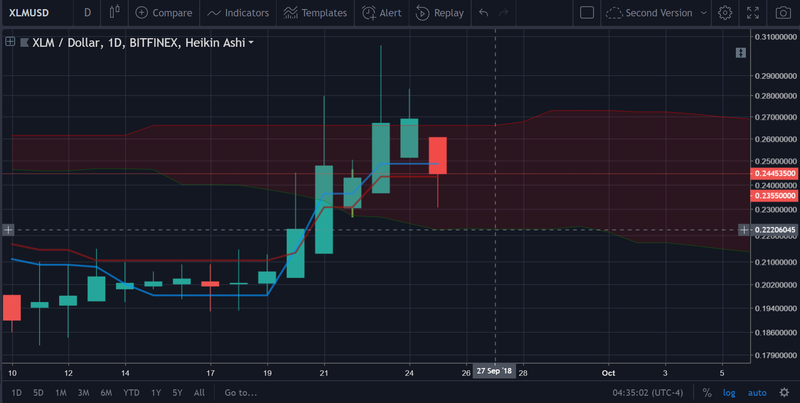 Bottom of the cloud is hanging at 22.7 cents and it appears as though the price is definitely headed to that point (at least) based on its current direction. 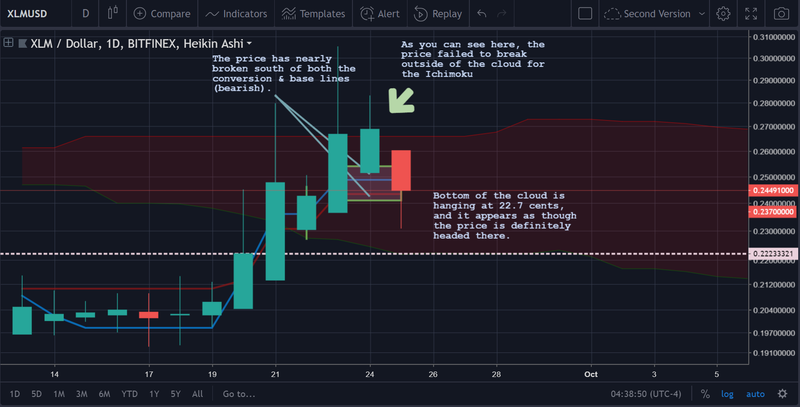 As you can see here, the price failed to break outside of the cloud for the Ichimoku. We’ve noted this in countless price analysis studies in the past, but the EMA-50 tends to be one of the more reliable points of support and resistance; this is especially true when looking at the daily chart resolution. 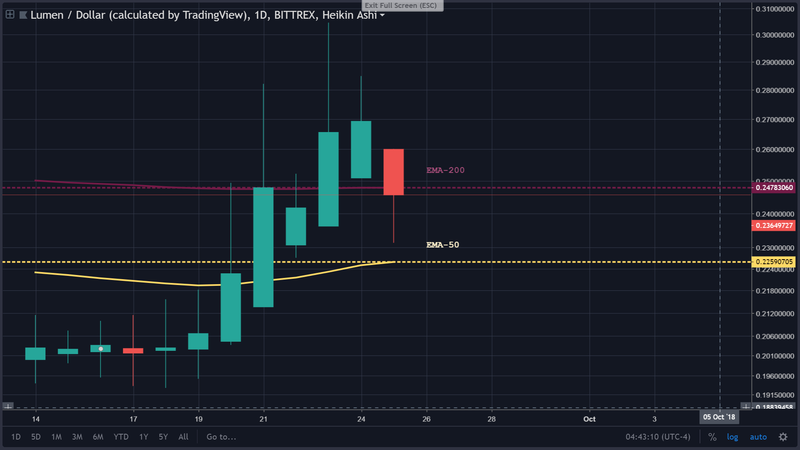 Currently, as delineated by the chart posted above, we can see that the point of support for the EMA-50 is at .2259 cents. Should the price break below there, it could be bad news for bulls (hardy har, not the bad news bears this time). The area within the box is showing us that the vallues of the EMA indicators used in the mean regression were converging before there was a reversal in price. Therefore, traders should be on the lookout for an expansion at this point because that would signal a strengthening in the negative trend. This was used in favor of the traditional MACD (Moving Average Convergence Divergence) indicator because the custom mean reversion indicator that we created is designed to be more reactive to the price than the MACD. Currently, the MACD is showing us no viable signals. You more than likely get the gist of how a pennant works by now from the above pictures. 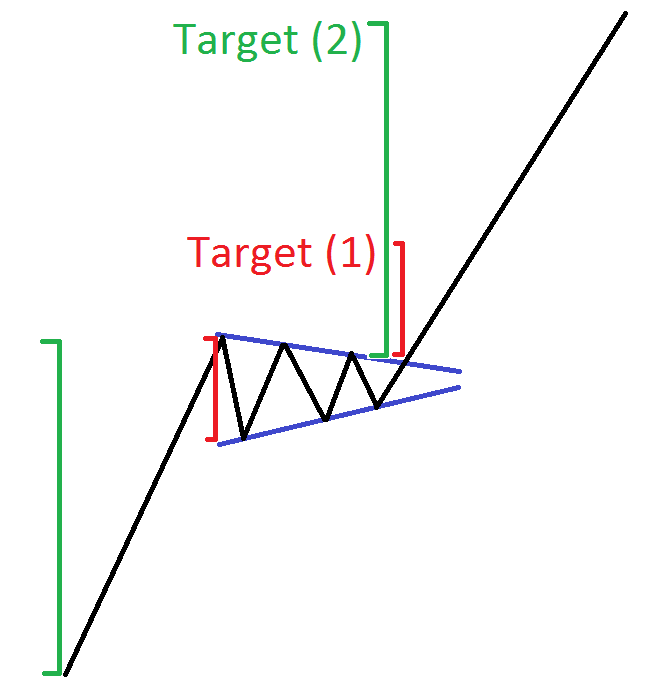 A chart formation that is in the shape of a pennant. It occurs over a decent amount of time (usually a few weeks, but could be longer). 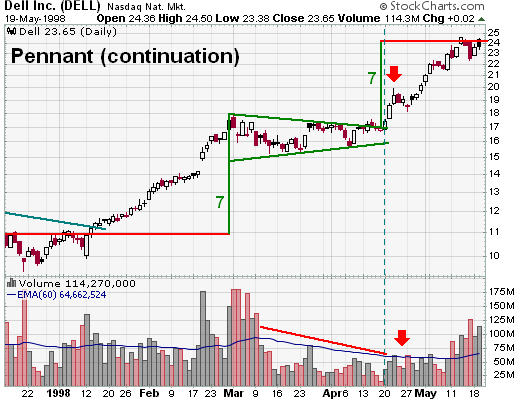 It is typically a continuation pattern (if it completes). So, it can either be bullish or bearish contingent upon the prior price direction. There is a massive bull pennant on the daily (and weekly) chart for $XLM. 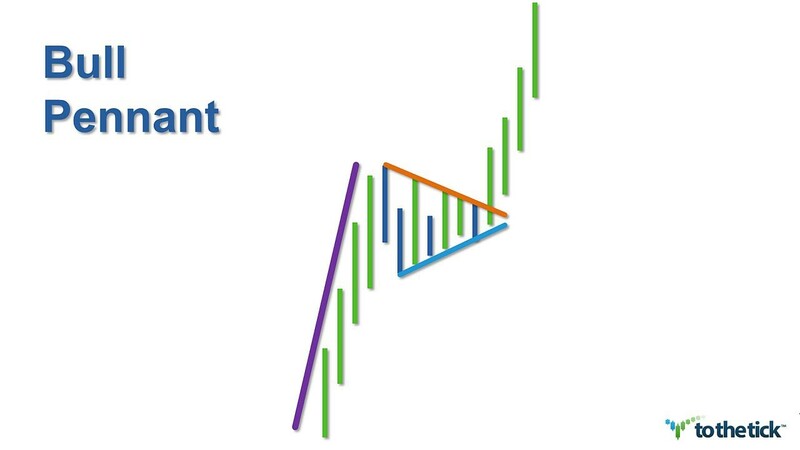 Given the fact that the bull pennant is so massive, the potential gains that could be amassed from this trade are absolutely ridiculous (in the long-term). It appears that there will be no breakout yet at this point in time because the price failed to break north of the diagonal downtrend resistance (series of lower highs that we saw above). Thus, the price is more than likely headed down to test the series of higher lows. The above picture summarizes what we predict will more than likely occur with the price action. 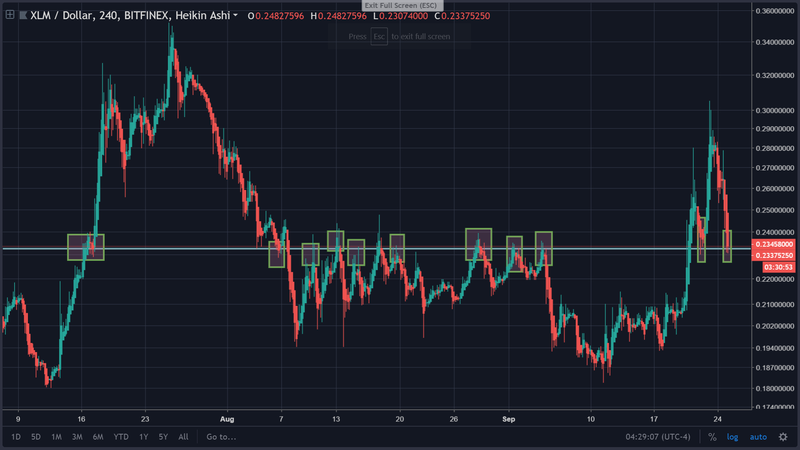 This price analysis epitomizes what our beliefs are in terms of $XLM’s price action in the near and distant futures. $XLM will exhibit bearish price action. We don’t expect that the price will exceed the previous highs that it was at. $XLM will prove to break out of the pennant that is is currently in a northward direction, proving to be one of the more promising options. Bitcoin May Either Bang Up or Bust Down: Which One?